Through the Eyes of an Intern: Part 1 /Hawks Aloft Inc.
Education Specialist Taylor Tvede teaching students about Harlan the Red-tailed Hawk. The first few weeks of my internship were spent assisting with education programs at local elementary schools. 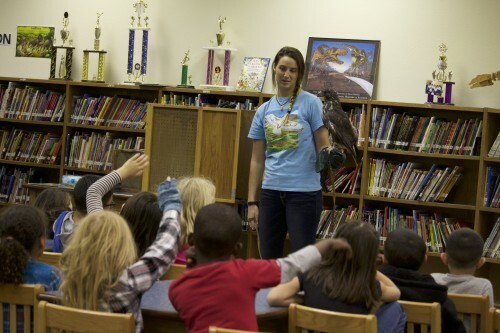 Half of the programs consisted of bringing two avian ambassadors to the school and giving a presentation regarding the bird and its history. The other half of the program was an activity to teach the students concepts about natural science. Since I have a history of work with the U.S. Forest Service, I found one activity, the fire ecology game, to be very interesting. The fire ecology game consisted of having children act out two different scenarios that represent the very different outcomes of forest fires. In the first scenario, the children are divided into groups of mature healthy trees, immature trees, dead trees on the ground or mature unhealthy trees (these are given a bug to represent their illness). The mature trees were spaced out evenly with immature trees kneeling under them. One student is then given “the fire stick” and told to tap their classmates that are sick or dead trees. This action leaves the healthy mature trees enough room to stretch out and the immature trees enough room to grow. The next scenario in the activity represented a forest that has had wildfires suppressed for years. Students were divided into the same groups as before with some assigned as healthy, mature trees and others as immature trees kneeling under them. Among these were still the unhealthy trees, which were again given plastic insects to distinguish them. Then, without any of the students moving an inch, the immature trees were told to stand up. Everyone became very crowded. Then the unhealthy trees gave one or two of their bugs to a tree that was standing next to them, spreading their disease because the forest had become overcrowded. Then the student that represented fire went through and tapped all the sick and dead trees. After the fire, there were very few or no trees remaining. The purpose of this exercise was to demonstrate that not all fire is bad for the environment. At the beginning of the exercise the students all believe that fire can only be bad. 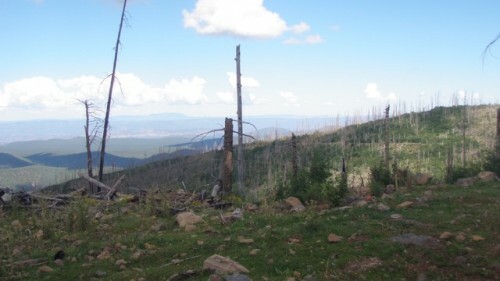 Beginning in the 1890s many of the forests in New Mexico have had fire suppression in place and have become overgrown. Prior to the suppression of fires, New Mexico forests were subject to frequent low intensity fires every few years. Because of this, forests did not become overgrown, which, in turn, kept future fires from burning out of control. 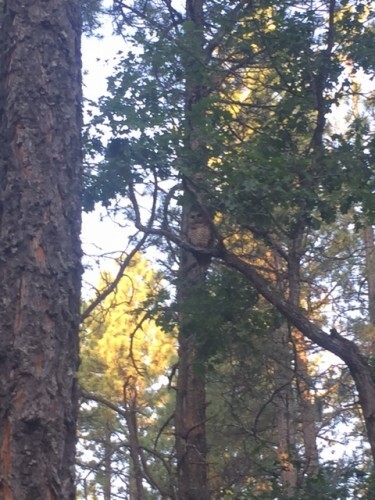 With new scientific studies, this history has come to light and the Forest Service, along with other government agencies, is working to remedy past mistakes. This often requires forest-thinning projects followed by controlled burns. Fire is such an important part of southwestern ecology. In fact, many plant species will only reproduce after a fire. The increase in plant reproduction is due to the nutrient rich soil, the increase in water availability, and newly available real estate opened up by the fire. Firefighters have noted that deer and elk will follow behind a fire and eat the burnt grass like they are attending a neighborhood barbeque. Many predators can be found in burn areas because their prey is attracted to the nutrient rich plants that are found growing there. When a fire burns out of control in an overgrown forest, there can be devastating repercussions. Not only can people lose their homes, but, if all the trees in an area are burned, this can create many hazards. Without the trees, there can be severe flooding and mudslides. In addition, if there are no mature trees in an area, the landscape cannot be repopulated. After catastrophic fires, tree saplings are often planted in the area, but it can take decades before noticeable change is seen. Fire ecology is a complex concept and many adults are still unaware of its importance in the balance of an ecosystem—especially that of the southwest. Teaching students about the importance of fire ecology will lead to a future generation that has a greater understanding of the ecosystem that they live in. Sunset in the Eldorado National Forest on the Amador Ranger District taken by Hannah Wheelen. Touchan, R., Allen, C.D. and Swetnam, T.W., 1996. Fire history and climatic patterns in ponderosa pine and mixed-conifer forests of the Jemez Mountains, northern New Mexico. UNITED STATES DEPARTMENT OF AGRICULTURE FOREST SERVICE GENERAL TECHNICAL REPORT RM, pp.33-46. Dieterich, J.H., 1983. 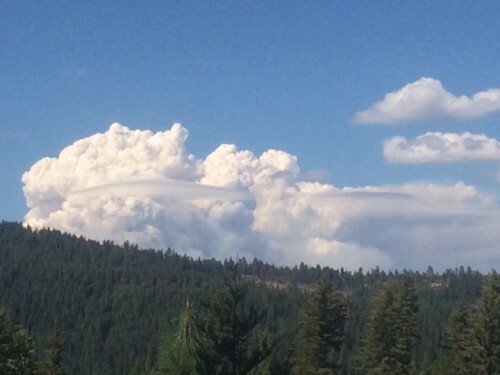 Fire history of southwestern mixed conifer: a case study. Forest Ecology and Management, 6(1), pp.13-31. Amanda Schulter is a field technician for the U.S. Forest Service and the current intern at Hawks Aloft.